Hey, busy lady! Are you tired of feeling run down, over-scheduled, stressed, and unhealthy? Do you want to get healthy but think it's too time-consuming or complicated? I've been where you are, and I've got good news! You can completely upgrade your physical and mental health with just a few simple strategies! 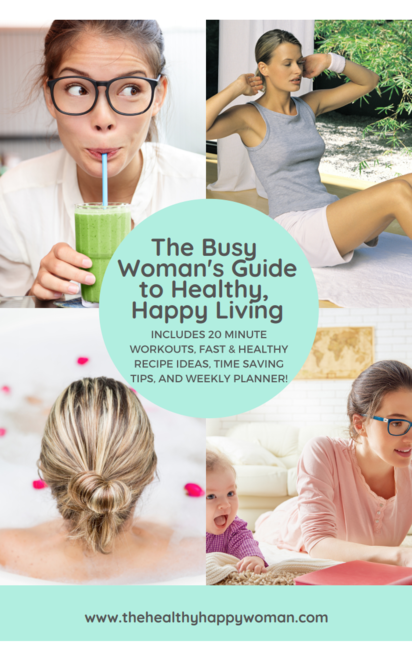 In The Busy Woman's Guide to Healthy Happy Living, I share with you my top 5 strategies that are easy to begin, don't take a lot of time to practice, and can completely transform your health and overall happiness in just a few short weeks! A 10-day workout plan for both beginners and seasoned exercise enthusiasts that you can do in the comfort of your own home! No guess work, because each day's workout is planned for you! You'll see results in as little as 10 days! My #1 tip when it comes to healthy eating - this one tip can give you more energy, curb your cravings, and give you glowing skin! You don't have to settle for just surviving. With a little help and guidance, you can thrive! This Ebook will show you how! *For the protection of Sally Nance, The Healthy Happy Woman, and copyright laws, ALL DIGITAL DOWNLOAD SALES ARE FINAL. By processing this request you agree and understand that there are no refunds for digital products once the documentation is sent to you.